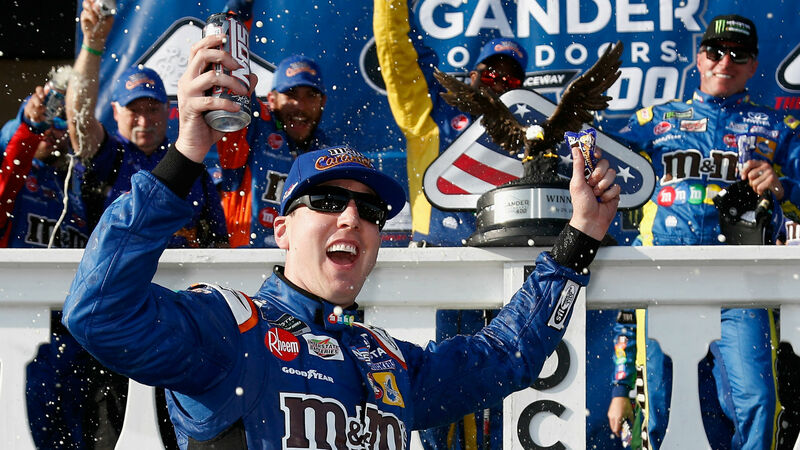 NASCAR is back at Pocono Raceway for the Gander Outdoors 400 on Sunday and Kyle Busch took care of business yet again, taking home the checkered flag. The win marked Busch’s sixth of the season and marked a successful defense of the Gander Outdoors 400 title. With the victory, Busch tied Kevin Harvick for the most in NASCAR this year and solidified his spot atop the point standings. The race started off with 13 drivers, including Busch and Harvick, forced to the rear for failing post-qualifying inspection. The two top drivers quickly pushed to the front finishing in the top four of Stage 1 and with Harvick winning Stage 2. The action was forced to overtime after a pair of late cautions including a bad wreck of Bubba Wallace’s 43 car who slammed the wall after his brakes went out. Wallace came away from the scene OK but the crash was bad enough to draw a red flag. Follow along with SN’s live updates and highlights from the Gander Outdoors 400 at Pocono. 6:06 — And Kyle Busch wins it in OT. His sixth checkered flag of the season. CHECKERED FLAG: @KyleBusch hangs on after a late restart and wins his second-career race at @poconoraceway ! 6:04 — Bubba Wallace is out of the care center and OK.
5:59 — Aric Almirola spins and brings out another caution. They’ll go to overtime in Pocono. 5:55 — They’re green with just three laps to go. 5:42 — They go to red now. Bubba Wallace appears to be OK, thankfully. 5:39 — Caution flag out for Bubba Wallace who takes a massive hit to the wall. 5:35 — Ten laps left at Pocono and it’s still Kyle Busch out front with Daniel Suarez on his tail. 1.8 seconds is the gap between @KyleBusch and @Daniel_SuarezG . 5:26 — Joey Logano blows a tire but he manages to make it to pit road under green. 5:20 — Cleanup is complete and they’re green again with Kyle Busch, Daniel Suarez and Chase Elliott leading with 28 to go. 5:10 — They got back to green but the caution flag came right out again for fluid on the track. 5:03 — Kevin Harvick has to head down pit road again to fix damage to the left rear. He made contact with Aric Almirola on their last pit stop. 5:00 — Clint Bowyer gets dinged with a speeding penalty on pit road. 4:58 — Brad Keselowski blows a tire, gets into the wall and the caution flag comes out. 4:50 — Kyle Busch takes the lead from William Byron now. And his brother Kurt blows a tire and has to head down pit road. 4:47 — Kyle Larson makes contact with Brad Keselowski. No caution but Keselowski took some damage. 4:43 — Green again and it’s William Byron, Erik Jones and Kyle Busch out front on the restart. 4:38 — Pit road speeding penalties for Kasey Kahne, David Ragan and Ty Dillon. 4:33 — Kevin Harvick takes the green and white checkered flag for Stage 2. Chase Elliott and Clint Bowyer finish behind him. STAGE WINNER: @KevinHarvick grabs his 33rd playoff point of the season with this stage victory at @poconoraceway ! 4:25 — Ten laps to go in Stage 2 and it’s Kevin Harvick, Kyle Busch and Chase Elliott out front. 4:15 — Corey LaJoie gets into the wall on Turn 3 and the caution flag comes out. 4:08 — Drivers start to hit pit road at laps 76, 77 and 78. 4:00 — And just like that, Kevin Harvick is the new leader in Pocono. 3:54 — Ten laps into Stage 2 and it’s Erik Jones holding P1. Chase Elliott and Kevin Harvick less than a second behind him though. 3:50 — They’re green again. Erik Jones and Martin Truex Jr. lead the way after pitting just before the end of Stage 1. 3:46 — Kurt Busch making some moves on pit road. He takes just two tires and gains seven spots. 3:38 — Chase Elliott grabs the Stage 1 win. Kevin Harvick and Denny Hamlin round out the top three. STAGE WINNER: @chaseelliott marches to the front and collects his second stage victory of the 2018 season. 3:35 — Unsurprisingly, Kevin Harvick is all the way up to P2 behind Chase Elliott and Kyle Busch is up to P4. 3:27 — And Chase Elliott is the new leader with 10 to go. 3:23 — Fifteen laps to go in Stage 1. After pit stops have all cycled through it’s Denny Hamlin, Chase Elliott and Daniel Suarez out front. 3:14 — Jamie McMurray gets hit with a speeding on pit road penalty. Then Matt Kenseth gets one too. 3:10 — Kevin Harvick is the first driver to hit pit road on lap 21. Daniel Suarez, Denny Hamlin and others follow on lap 22. 3:00 — Ten laps in and it’s Daniel Suarez, Denny Hamlin and Brad Keselowski out front. Kevin Harvick and Kyle Busch are forcing their way up though and sit P9 and P12, respectively. 2:50 — It’s green flag time in Pocono and they were four-wide out of Turn 1. And Kevin Harvick is already climbing up the leaderboard. 2:40 — Engines have been fired at the Tricky Triangle. 2:25 — It’s race day in Pocono. Almost time for the green flag to get things rolling.